Photon mapping is the process of modeling the true interactions of light and energy within an environment to create truly photo-realistic lighting effects and visuals that make current shading technologies look like they are something from the 8-bit era. Nonetheless, photon mapping is very complex on a theoretical level, and deep understanding of it can only be achieved with advanced knowledge of physics, optics, mathematics, and 3D graphics. 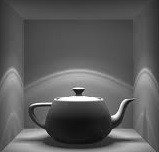 The basic idea of any system is to simulate light rays moving from a light source and calculate the intensity based on each infinitely small point on a material.A basic rendering system must therefore have the ability to generate rays, intersect rays with the scene, calculate the lighting per interaction, and perform reflection and refraction.